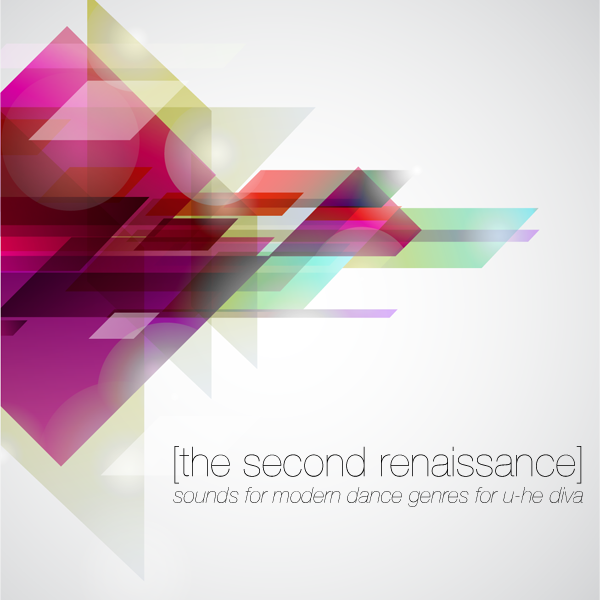 The Second Renaissance is a collection of sounds aimed for modern popular dance music genres and is squarely built on the new “Digital oscillator” introduced with Diva 1.3. This soundset contains no Moog or Roland oscillators - but brings out the new sounds capable with the new oscillator. impossible to make with diva. While the new oscillator quickly got known as the “Supersaw oscillator”, it has to be said it’s much more than a supersaw, and can actually be said to be the most versatile sound source in Diva, with everything from gorgeous triangle waves and wicked feedback sounds to tunable noise and incredible lush stacked sounds with the supersaw. The king of software synthesizers just got better. Style: EDM and modern dance music genres. IMPORTANT - The Second Renaissance for Diva is a soundset for the U-he Diva synthesizer. This product requires a fully working copy of Diva to work. This is not a sample set. Please check out the FAQ before buying.